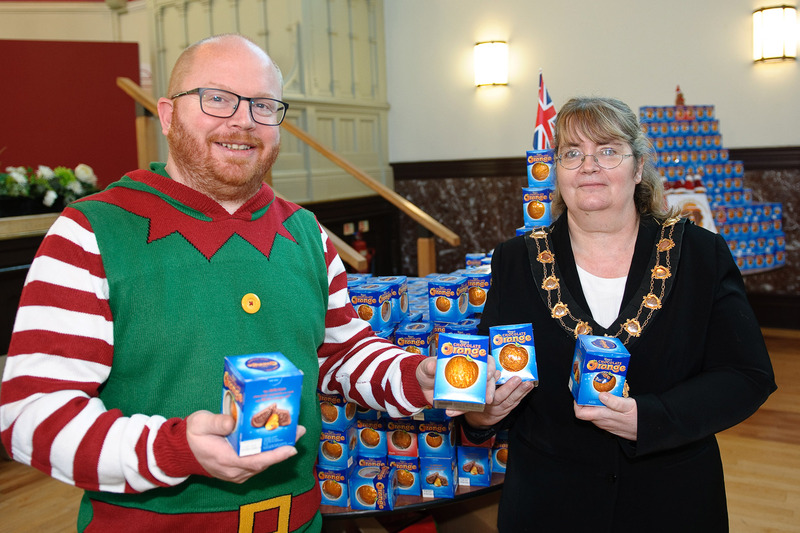 Stacks and stacks of chocolate oranges stood proudly in the town hall assembly room earlier this morning, ready to be delivered to hospitals and hospices across the North West today. 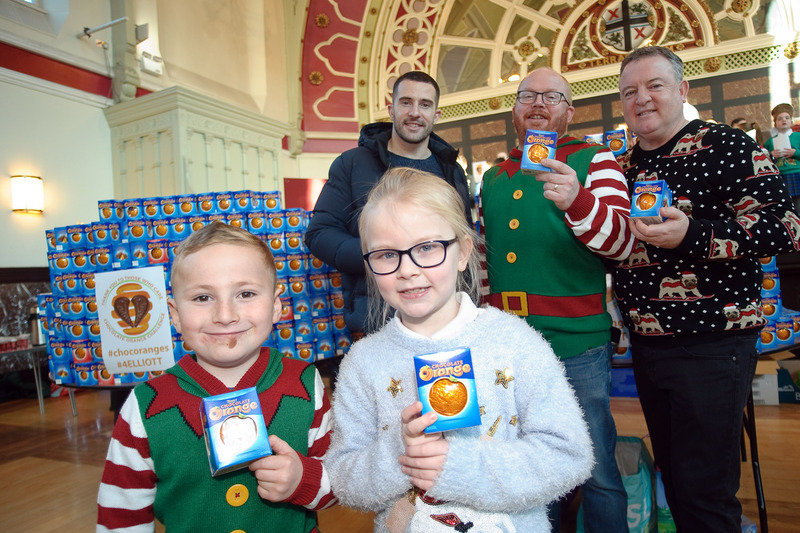 A record-breaking 11,000 Terry’s Chocolate Oranges have been donated this year as part of the national Chocolate Orange Challenge 2018, the project of St Helens resident Chris Lamb who lost his son Elliot to a condition called Congenital Cytomegalovirus just before Christmas 2010, aged just four. Those to turn out to show their support to Chris before he left to distribute the treats included Deputy Mayoress of St Helens, Councillor Janet Johnson and St Helens actor Michael Parr. 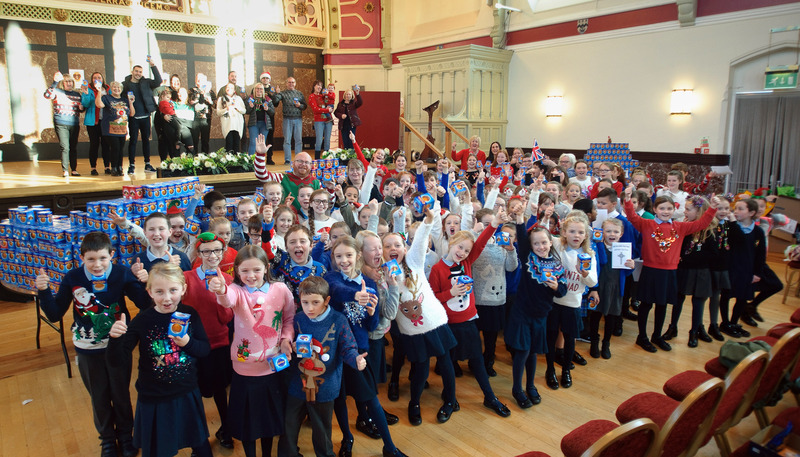 While pupils from several primary schools across the borough were on hand to spread some festive cheer by singing Christmas carols on stage. Set up in 2011, the appeal has seen well over 30,000 chocolate oranges collected which all started as a light-hearted joke between Chris and hospital staff when he bought a chocolate orange as a thank you to one of the physiotherapists for their kindness, care and compassion when Elliot was in hospital. Word soon got around among other medical professionals, and Chris ended up buying more and more every time Elliott was in hospital. Following Elliot’s death, Chris decided he wanted to do something positive to cherish his memory, and so came up with the idea of collecting as many chocolate oranges to be shared with hospital staff nationwide. Chris said: “I just want to say thank you to St Helens Council and all our supporters because this year has been a record year. “We’ve collected about 11,000 Chocolate Oranges and we’re going to deliver them to doctors and nurses all over the country, because they are the people who make a difference to our lives. The Steve Prescott Bridge is programmed to be lit orange this evening.